The advancement of the Internet has brought things so close that they are just a click away. In olden days, when people needed photographs for their publications, they used to hire a photographer who did a photo shoot for them. Then a handful of images were selected from the hundreds the photographer had snapped. This method is followed even today by some publications. But many are moving towards stock photography agencies because a photo shoot is costlier and also takes a lot of time. A stock photography agency is a place where thousands of photographers come together to share their photography collection with the world and where the buyers can go and select the photos they like out of the millions of photographs available. The cost of an image is usually a few dollars and it is ready to be used and downloaded by just a click of a few buttons. I recommend you go for Depositphotos. 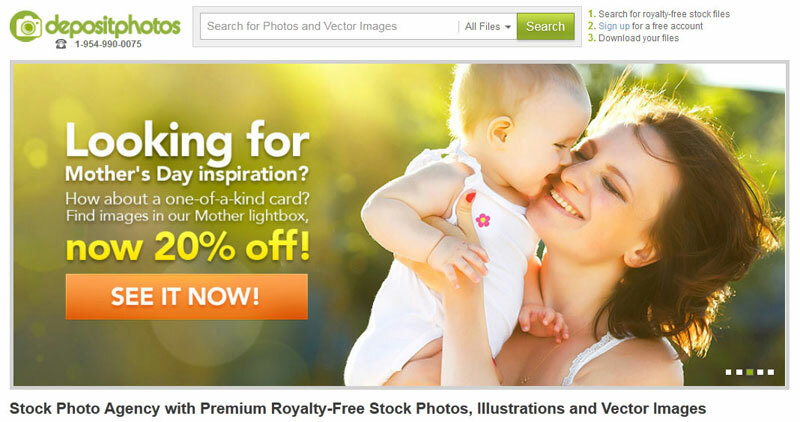 Depositphotos owns a collection of over 13 million images, vector arts and videos! Headquartered in Florida, USA Depositphotos is a place where buyers and sellers from over 192 countries come together to do business with photos. To help your navigation easier they have categorized their images in different categories. Whenever they receive a new file, they automatically assign it to the appropriate category to help you do a hassle free search. Also their search functionality gives you many options to filter your results. If you want photographs from only a particular photographer then you can key in his name; if you want business related photographs but want to exclude the images which contain a computer on it (as you might think it's too common) then punch in the word "computer" in the Exclude Keywords bar; if you want to exclude videos from your search results uncheck the Videos checkbox, if you know what I mean. See the image below which displays the search options to get a better picture. The images of Depositphotos are not intended only for publication on websites or other journals. You can also use them to blend in with your website's template, use them as posters, as ads, etc. One such example is their business card designs. Doing a business without an appropriate business card is akin to committing a crime. We need business cards to exchange with other professionals of our business and hand them over to our prospective clients. Depositphotos have a wide range of business card templates which you can use to create your own cards. See the image below for some example templates. You just have to replace the text in the cards with your own and you are done. All the files available on Depositphotos are "royalty free", a term which implies that once you buy a file you get a non-exclusive lifelong license to use the file without paying Depositphotos or the respective photographer any monthly payments. If you want to surf through their collection of 13 million files, sign up by making a free account. Let me know in the comments below if you have any doubts. Name : Depositphoto.com. Overall rating : (4 / 5). Reviewed Date : Wednesday, April 17th, 2013. Pictures paint a thousand words, so as they say! Thank you for the tips! For your photos and images, kindly check this out http://wordpress.org/plugins/iframe-embed-for-momentme/. Embeds a photo gallery with a 360° view, providing you with a multi-point-of-view experience and its free.